Test Drive the New AutoCAD! If you are located in the San Francisco Bay Area or the Boston Area, you have a rare opportunity to test drive some new features in AutoCAD and contribute your feedback to future releases. The AutoCAD Product Design and Usability team would like to invite you to join them for a sneak peek and test drive of a future version of AutoCAD, focusing on changes to the user interface and productivity enhancements. Members of the AutoCAD team will be there to introduce you to new and enhanced AutoCAD features. In a casual focus group style, the design team wants to share with you their design-ideas-in-progress and ask for your input as they solidify their ideas for an upcoming release. They’ll include time at the end of the session for general feedback and they’ll be happy to discuss any issues, future directions, or wish list items with you at that time. Your input is critical in shaping the future of AutoCAD and the AutoCAD team depends on and values your ideas. After this session the design team will make key decisions based on your input. Plan on spending the day (9am to 5pm) to meet the team and participate in hands-on sessions with a future release. You will learn valuable tips and get step by step instructions. Snacks and lunch will be provided. Seats are limited so please take the below brief survey so we know your user profile. Feel free to contact me, Shari Nemerovski (415-507-8217), with any questions about registration for this exciting event. For my blog readers on the East Coast, I'll be presenting at two AUGI CAD Camps in October -- in Baltimore on the 7th and Virginia Beach on the 9th. If you haven't been to a CAD Camp before, they're one-day events with lots of classes presented by top-notch national and local instructors. It's a great way to get a lot of information in person, in one place. And as far as training goes, it's very affordable -- $199 for the whole day, including breakfast and lunch. If you're not on the East Coast, there are other CAD Camps scheduled in Boston, Anaheim, San Francisco, Denver, Reno, and Boise, so hopefully there's one near you. There's also the AUGI Design Academy coming up in London at the end of September. Admittedly not all the classes apply to LT, but there are a bunch on dynamic blocks, CAD management, new features in 2009 -- and of course my class (you knew I had to plug it), on customizing AutoCAD and AutoCAD LT. If you'll be in Baltimore or Virginia Beach let me know -- I'd love to say hi! Status Bar -- Icons or Text? In LT 2009, the familiar toggles for ORTHO, POLAR, etc. have been converted to icons, saving a lot of space. But if you're having trouble remembering which icon does what, you can bring back the words, by right-clicking on one of the icons and unchecking "Use Icons". The command is CAL. It can also be used transparently by putting an apostrophe in front -- 'CAL -- so that results can be used inside other commands. Did you know that LT has had a built-in calculator since LT 2006? It's called QuickCalc, and it's a palette-based calculator with all sorts of functions. 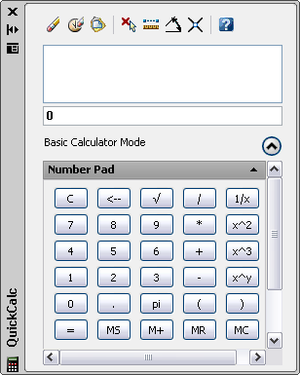 You can turn QuickCalc on from its button on the Palettes panel of the View tab, or with the keyboard shortcut Ctrl+8. Once it’s on, you can dock it to one side of the screen and/or set it to autohide for easy access later. Across the top of the QuickCalc palette are several shortcut buttons for commonly used commands. “Clear” erases your current entry. “Clear History” erases your recent calculations from the large box below the toolbar. “Paste to Command Line” puts the current result in the command line, where you can use it as a value in an active command. The next four buttons return information based on points in the drawing. “Get Coordinates” and “Intersection of Two Lines” return a coordinate pair, the first from a single pick and the second from four picks that define two lines. “Distance” and “Angle of Line” return a single value—either the linear distance or the angle between two points. Finally, there’s a Help button, in case you forget what any of the other buttons do. The two windows below the Toolbar are the History Area and the Input Box. Enter the values & operators for your calculations in the Input Box, and check your work or review previous entries in the History Area. You can even use the right-click menu to paste a previous value or expression into the Input Box. Directly below the Input Box is the Number Pad. This looks a lot like any other calculator you own, with a few extra functions like “square root” and “pi” buttons. You can enter numbers into the Input Box either by clicking them in the Number Pad, or using regular keyboard entry. For more complicated calculations, there’s the Scientific area. This contains several trigonometric and logarithmic functions, along with some extras like converting between radians and degrees. My personal favorite is the Units Conversion area. Most projects in the US use feet-and-inches, but we’re starting to see more and more projects that are required to be documented in metric units. The Units Conversion area enables you to easily convert various length, area, volume, or angular measurements into a different unit without ever leaving AutoCAD LT. Once you’ve completed your conversion, clicking the calculator icon sends the converted value back to the Input Box, where you can use it in another calculation or send it to the command line for immediate use. Finally, there’s the Variables area. This is the most powerful of the four entry areas, because you can create your own constants and functions and store them here for later use. The Variables area comes pre-loaded with several constant and function definitions, including Phi (the golden ratio) and dee (distance between two endpoints). Double-click a variable to paste it into the Input Box. If you double-click a function (identified by an “x”), press Enter to acquire the points or data needed to fill in the equation. 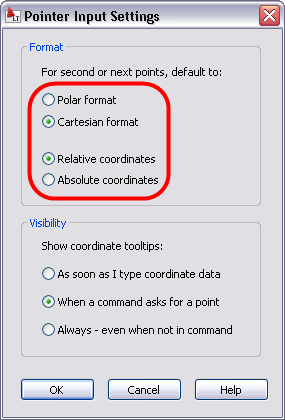 Icons along the top of the Variables area enable you to create a new variable, or edit or delete existing variables. The calculator icon, as in the Units Conversion area, returns the selection to the Input Box. Any these palettes can be collapsed to make it easier to see the ones you’re really using. For several versions now, a "copy" option has been included in the Rotate and Scale commands. This means that you can create a rotated or scaled version of an object while leaving the original intact. Today's tip is on another "new-to-LT" feature: non-rectangular viewports (also known as polygonal viewports). Draw it from scratch. (MVIEW command, Polygonal option.) If you want to draw the outline & convert it to a viewport in one step, this is the command for you. Convert an existing object into a viewport. (MVIEW command, Object option.) 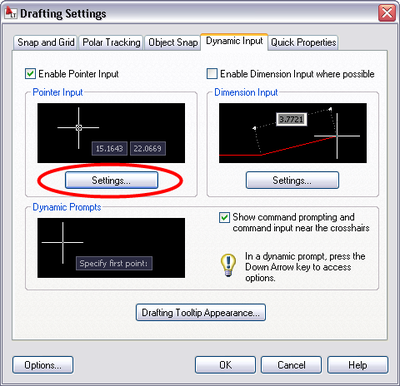 If you already have your object drawn, you can use this option. This is also useful for creating circular or elliptical viewports, which can't be created with poyline segments. Clip an existing viewport with a non-rectangular object. (VPCLIP command.) This option combines the first two, in that you start with a rectangular viewport and a non-rectangular object (poyline, circle, whatever), and you end up with one viewport in the shape of your non-rectangular object. The command also contains an option to draw the clipping boundary on the fly, if you haven't already created it. 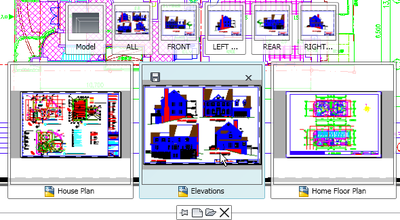 If you're not on LT 2009 yet, you can still use non-rectangular viewports if someone else (with full AutoCAD) creates them for you. You can move them, copy them, resize them, and even change their shape with PEDIT -- you just can't create new ones. The larger images at the bottom are for the open drawings; the smaller images above represent the layouts contained in the highlighted drawing. This means that you can easily switch to any layout in any open drawing. Try doing that with the keyboard! Quick View Layouts & Drawings also have a couple more nice tools, including the ability to plot, save, or close any open drawing, or export a layout to a modelspace-only file.